In this article, I will show you how to wirelessly send the audio signal of your Apple TV to alternate AirPlay Speakers (e.g. another Apple TV or an AirPort Express). A nice feature, introduced with Apple TV 5.2 in 2013, is the option to route your audio wirelessly to alternate speakers. Send stereo audio from movies, TV shows, and other videos on Apple TV to AirPlay-enabled speakers and devices (including AirPort Express and other Apple TVs). Your HDMI signal goes to a beamer, but you want the audio signal to be played with a stereo system. You want to choose your music from iTunes in the cloud with Apple TV, but it shouldn’t be played with the “bad” speakers of your TV. There are two ways to send the audio output to alternate AirPlay Speakers. While a movie is playing, hold the Ok button of the Apple Remote pressed until a menu appears. The tab “Speakers” shows your audio output options, including other Apple TVs and AirPort Express stations. Use this menu also for adjusting the output volume. The second way is: If you want to use another AirPlay Device as Audio out for music or other content, go to “Settings > AirPlay”. You can see all the devices/speakers connected to your home network. Select the desired AirPlay speakers. In the past, there were some problems with this feature which should have been fixed by now (so make sure to use the latest software updates). For me, this feature worked without problems if I start the movie directly from my Apple TV. I had some synchronization problems when I sent the movie from my iPhone via AirPlay to my Apple TV which redirected the audio signal to an AirPort Express (an really old AirPort Express, so not sure if this is the problem…). Do you have any experience with a setup like this? Why do use it? Does it work? Just leave a comment. I purchased recently Apple TV, and I did have 2 LibraTone Live speakers….. Like to have the sound from Apple TV to the LibraTones, but…. None of your solutions did work…..
Do you have another solution, or…..
can you describe what’s exactly the problem in your AirPlay setup? Hi. I have this exact connection. I use it for listening to music from YouTube. Recently I hooked the express to my SONOS speakers so I can increase the depth of the audio from videos played on Apple TV which is connected to my Samsung TV. Unfortunately I stll get a two-second audio delay. Everything is upto date software wise. Any help ? As far as I know, the 2 seconds are the buffer in the AirPlay protocol. Thanks for the article. I have this setup (Atv3 connected to a beamer and airplay speakers). In the Atv I configured that Airplay uses the speakers for audio. It works fine when I play a movie directly on the ATV. But when I stream a video on my macbook Air and I do screen mirroring to the Atv, the sound stays on the beamer and does not get forwarded to the airplay speakers. Any idea how I can get that working? check your audio output routing. The easiest way is: Hold the alt key und click with your mouse on the audio icon in the top menu bar (upper right corner). Instead of the volume bar all the possible audio outputs appears -> choose the Apple TV. The sound gets to the ATV from the Macbook. But the ATV does not use the configured Airplay speakers for the output. And If I go to the mentioned audio settings and choose the airplay speakers direcly, the sound gets forwarded to the Airplay speakers. But the video stops getting played on the ATV. Hi Thomas. I experience exactly the same thing. My ATV is pumping out video to my Samsung TV but not pumping out the audio to my AirPlay speakers even though I selected them under Settings> AirPlay as shown above. It happens the same to me. The ATV doesn’t enroute the sound to the Airplay Speakers when using mirror in iMac or MBP. It’s an stupid thing as from my iphone or Ipad runs smoothly …. Any free soul knows how to solve it? Hi David, did you find any solution?. If you use beamer in Mac for streaming films it works, but I haven’t been able to look for any other solution. Works perfect as described, my wish would be get the option to delect more than one airplayspeaker (as you can with OSX). I can get it to work (redirecting to AirTunes and my receiver), but the output is incredibly low. I have to turn the volume on my stereo up to about 95% to hear anything. Inevitably, I forget when changing to another source and will ultimately blow out my speakers. 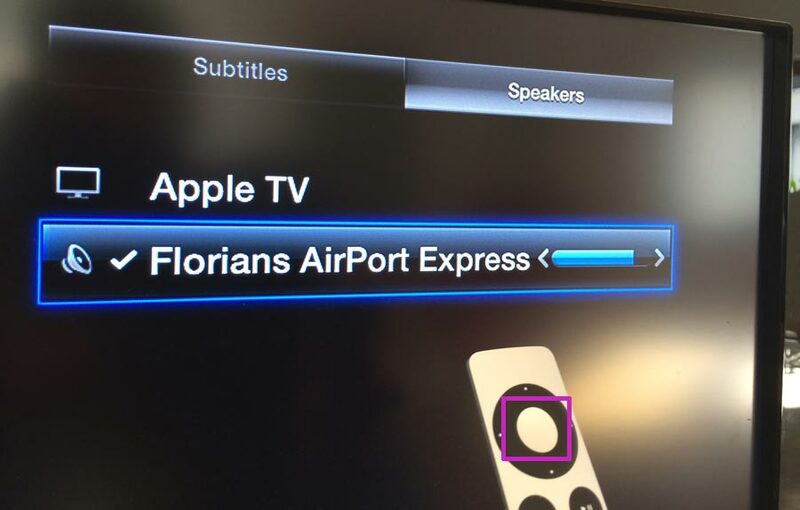 Does anyone know if there is a way to increase the audio output when streaming audio FROM Apple TV to an Airport Express that is connected to a stereo system? What I would like to do is to send the audio from my ATV to my iPad or iPhone using wifi. That way I can plug in my headsets to my iOS device and listen without wires. I can currently do it through one of my ATV’s via an LG wireless speaker system (blueray/dvd player). I have heard that it can be done directly from your ATV without the wireless speaker system. @KellyNYC: Have you tried the adjust the output volume like described in the article? @Finn: You need an App that acts like an AirPlay receiver (because that no officially supported feature of AirPlay on the iPad). hi… i have a problem to send the sound from apple tv to my wireless jaybird earbuds. so, i have apple tv third generation, an indigo bluetooh wireless transmitter/receiver, a jaybird wireless earbuds, i also have the optical cable and optical to 3.5mm audio adapter. after i connected all of the devices and successful pairing the wireless earbuds with the indigo transmitter, the sounds from my apple tv still didn’t come out from my wireless earbuds. so, hopefully anyone who read this case, will help me how to figure out this issue. fyi, my tv doesn’t have audio jack port, optical audio port or any audio out port. that y i try to find a way to using the apple tv to send the sound to my wireless earbuds…. Was wondering if you can send audio through the tv speakers AND also an airplay receiver. Any solutions for playing ATV audio to both the TV speaker and to an AirPlay speaker in another room at the same time? Did u get any answers to this question? Researching the same query all I can find is a work-around by playing the video via iTunes on my Mac, using my ATV to mirror to my Samsung TV and make sure that my AirPlay Speaker (BOSE Soundlink) is also selected in iTunes. Not sure if this helps or if anyone else has a solution? I have airport express connected to an onkyo sr506 receiver that plays music via my stereo system. I can stream music etc no problem. Then I put apple TV into my last HDMI port and and can run video via my beamer through the onkyo system no problem. My problem however is getting sound via my speakers as well. I selected the source as suggested here and there is no difference. I can mirror my PC to my beamer and play sound via the computers speakers but when I try to select the output to be my airport express it doesn’t allow it via my pc. It selects as shown above on apple tv settings but still doesn’t work. Ok, for the sake of anyone else with the same issue. I couldn’t fix the issue as suggested by using Airplay because my receiver is relatively old (2008). Basically the HDMI ports I have only transmit video signals but not sound. By adding a toslink cable from my apple TV to my receiver and adjusting my settings on the receiver to pick up the optical signals it works great and plays apple TV sound through my receiver attached speakers. It was quite a laborious process diagnosing this especially as I hadn’t really learned about the Receiver before (Onkyo SR506). A friend did all the original installations. So this was a good learning experience. Basically if you run into this issue check whether your receiver sends sound signals via HDMI. If it does you shouldn’t be getting the problem I had. If it doesn’t you’ll need analogue cables to go between each device connected to your receiver that you want to play sound through. Then you’ll need to adjust receiver settings to reflect which cable port you’re using (in my case on the Onkyo it was the digital input button – setting Optical 1). @Steve: Interesting. Thanks for the feedback! Is it possible to play the left channel on one speaker and the right channel on the other speaker? I know Sonos is doing this but I don’t like that they don’t use airplay and i wanna watch movies so there’s no place for 2 sec delay because of an airport express in between. I wanna be sure before I buy all this expensive technostuff. Your post solved what I’ve been looking to do over a few months and no one at Best Buy thought was possible (yet). I didn’t want to have a cable from my apple tv to my external speakers. However, do you know of a way to stream sound from my smart tv in general to my airport express wirelessly? I have a 3d tv and Apple TV doesn’t support 3d I don’t believe. My Samsung Smart Tv doesn’t have an airplay feature. Any suggestions? Ive got my ATV hooked up to a beamer via hdmi and use the optical out to a stereo for the sound. I play movies and tv through my ipad using airplay and this means i get simultaneous beamer picture and synchronised sound HOWEVER the sound comes from behind me rather than from below the beamed picture. What i want to me able to do is to wirlessly send the sound to an airplay enabled speaker sitting below the beamed picture so that i can still airplay movies from my ipad and get snychronised sound and beamed picture. Dont want to invest in this unless i know it would work. Any suggestions how i could get this to work as running a cable to underneath the beamed picture just isnt possible!? That’s exactly what I want to do too. Was looking at Sonos instead but it’s far too expensive and not really setup for use with a projector/Beamer. I’m worried that connecting audio via Airplay won’t be in-synch with the picture though? Before investing. Just wondering if both the speakers AND the tv speakers can work at the same time or always the tv speakers will turn off? Hi. I have three ATVs and I’d like to stream music from iPad (iTunes/IPod/Pandora/Rhapsody) to all three (or two) ATVs simultaneously. I want to be able to select multiple “speakers” without a Mac or PC, just my IOS. Is this possible? It seems as though it should be such an easy/logical feature. As far as I know this is not officially supported for iOS by Apple. I think you have to try third-party-apps. I wondered if there is a way to change AirPlay output from appleTv via the remote app. Hi guys, i have a Harmon Kardon Aura speaker , however it seems that the sound is not coming when i select it on my apple tv for speakers. Any idea how it can be solved cause i thought it will be pretty straight forward but seems like its not really working. Appreciate it guys! Thank you so much for posting this! Your article has helped to enhance my whole AV experience with my Apple TV!! I am having problems with airplay from my computer to TV. but the second i connect it to the tv the sound is constantly inturpted, every second it pauses and starts? why? i have tried resetting my apple tv but it hasnt made a difference. i then tried it on a different tv and on a sound system but it still happens. do u have any suggestions on why this keeps happening and what i can do to fix the issue? I have this exact set up with a projector connected to apple tv and stereo to airport express. I have a slight delay but the other way around. the sound comes just half a second before the picture on the projector. Basically the projector is delayed. Do you know what could cause this and how i can resolve it. Thanks in advance!! Thank you so much for the article, that was very helpfully for me today. Does this setup (video wired to projector and audio to airplay) work with an iPhone or iPad instead of ATV? Here is my setup currently for watching films… I have a Mac mini which is connected to a projector with a very long HDMI cable (the computer is, I believe, from late-2012). I take the sound digitally out of either the USB output or the digital optical fed into an external DAC unit. I would like to use an Apple TV to get rid of the long HDMI cable, that is, Apple TV used as an HDMI dongle into the projector. This should work I believe, but when I tried it a year ago or so, the picture quality was pretty bad and I turned back to the cabled system. I am not sure if this was because of an issue with the Airplay or not. I still get a bad delay. Over a second. I have to use the built in speakers watching tv or film over ATV due to the delay when using the above setup. I bought the ATV and the AirPlay receiver particurlarly for this use. does Apple say this should work to watching iTunes content or internet film or tv content? I have a Samsung Smart TV ue48h6200 & Sony Airplay/LAN Speakers Sony RDP-X700IP & SA-N310 and wish to stream audio from TV to these speakers. Possible ? hey! so I’m trying to help my folks out, they have Apple TV and my dad likes to play music through it but he wants to get my mum speakers so she can hear the music while she’s in the kitchen, so a second speaker is needed.. would this work? Ie keep playing the music through the Apple TV and through the additional speaker? I just hooked up an AppleTV 3 to my Samsung UE32HE5000 and I play Youtube streams to the TV while the sound goes to my audio streamer which supports AirPlay. But I needed to use that hidden context menu (push the OK button for 2 seconds) to crank up the volume. That’s all. Image to the TV and sound to the audio streamer (Auralic Aries). I set the speaker to my default audio device in my Apple TV settings. When I start playing something on Hulu, Netflix, whatever, it always defaults to the ATV instead. If I pull down the audio options, I see my external speaker there. If I select it, usually it just doesn’t stick after I navigate away. Occasionally it sticks on the external speaker, but usually I hear no sound. It’s not the volume on my speaker or TV, so I’m not sure what else to try. Has anyone else run into this? I’ve also tried restarting the ATV and speaker and no dice! LIke many other Apple TV users here in the discussion I had the problem of not being able to stream video to my beamer (connected to one Apple TV) AND audio to my speakers (connehcted to another Apple TV) (at least when using stream mirroring or non Apple software). I have been looking for a solution for over a year now and just found an App that does exactly what I wanted to do (and more). The App is called Airfoil. There is a free test version (after 10 minutes the sound quality is getting bad). Hope this helps others with the same problem. This article is great! I’ve been using a MacOS app called Beamer to AirPlay movies from my Mac to my Apple TV, and thanks to your instructions about how to access the speaker menu using the Apple remote I’m able to listen to the audio using headphones plugged into a nearby Airport Express. Brilliant thank you! I’m was wondering, before purchasing the Airport Extreme( http://www.macworld.com/article/2033…fe-choice.html ), if it was possible to connect my 3 Sony Airplay speakers ( https://esupport.sony.com/US/p/model…OC=3#/howtoTab )to the 3 LAN Ports of the Airport Extreme and airplay simultaneously as multi-room audio from my Iphone ? Any other suggestions ? No. Airplay wireless speaker output does not work. Hi, must be stupid but cannot see the link to a problem that has been posted in the past. Have just purchased a GGMM M3 Wireless speakers to link to a 2nd generation Apple TV via my router. It links but with very little sound even a full volume. One of the previous comments refers to a link to resolve this problem but I couldn’t find it . Hello. I want to use my Apple TV to watch movie and look at TV. Apple TV to the screen with HDMI for the picture. Then I want to send the sound to an Air Play speaker. But then I got the 2 second delay of the sound. What can I do? I want to play music on the same speaker too. Not at the same time of course. Something I can do? Thanks for the suggestions, FLO! I will give them a try. Do you know how to prevent the ApplePod and AppleTV from disconnecting? Sometimes during a movie or show, the AirPlay connection is severed. Normally I go back into the AppleTV Audio settings and re-establish the connection. Then go back to my App to continue the video. But this requires several steps and interrupts the flow of our entertainment experience. I would like to permanently maintain that connectivity. Is this at all possible? Hi, I have an AppleTV3 connected to a projector via HDMI andAirplay set to AirportExpress2 connected to a stereo amplifier. There is no problem with sound when playing any media on AppleTV or streaming video from any iOS/MacOS device but when streaming music from iTunes or Photo playlist an audio is not going. I never tested direct audio output from AppleTV because I have no any other device with DAC (TV, AV-receiver etc). Any advice, please. How can these 2 issues be fixed?